À LA PORTE St. MARTIN. English: AT THE THEATER PORTE ST. MARTIN. - Christ, what a beautiful act... no, but really a lovely act... what a splendid act! 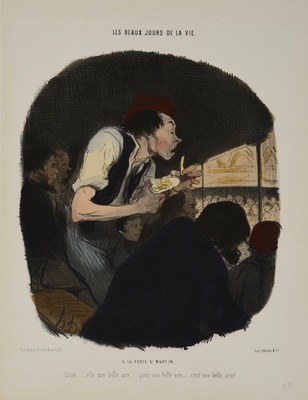 The scene in Daumier’s lithograph takes place in the box of a vaudeville theater. From the 1830s onward, the light entertainment these theaters offered became popular—especially in the northern and eastern boroughs of Paris. Vaudeville theaters attracted both bourgeois and lower class audiences.